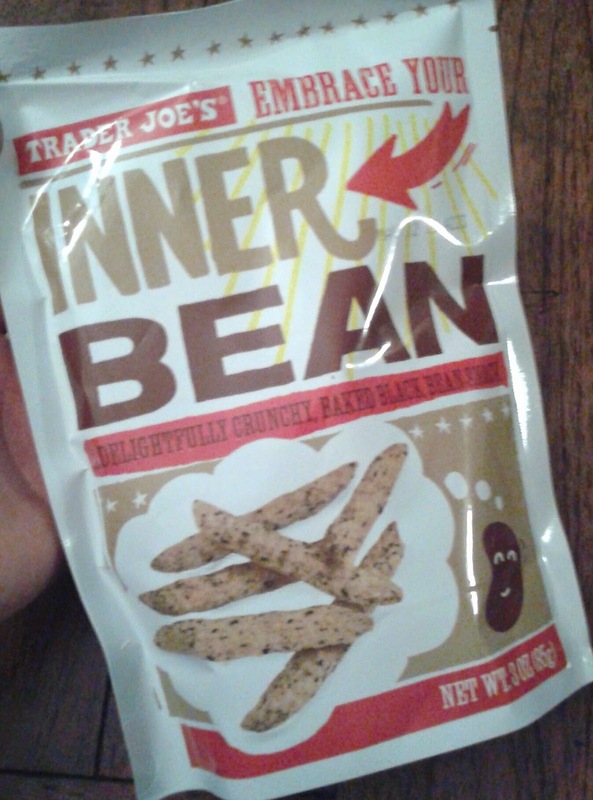 Straight from the folks who previously brought you oddly inspired snack sticks with groan-worthy puns for names comes....Trader Joe's Embrace Your Inner Bean! What's next in this line of veggie tranquility inspired munchies? Some Lettuce Be? Romaine Calm? Bay Leaf in Yourself? Why can I come up with only puns for shrubbery-esque veggies? I dunno, leaf me alone! Regardless, before branching out to any other snacks of this ilk, TJ's really needs to buckle down their craft. Just like those Inner Peas were borderline good but missing a little somethin'-somethin', so do these beanie bad boys. They're just on the cusp of being really darn tasty but just don't get there. It's not the texture - a little foamy, but reasonably crunchy but it's the taste itself. First, they're made with rice flour, which doesn't have the same supporting flavor of a regular corn or tortilla chip. I'm not a fan of rice flour at all, I guess, despite its gluten-free properties....wait a minute...these aren't gluten-free? Well, let's read the ingredients...no gluten in any of that...hold on..."May contain traces of wheat, milk, soy, fish, and shrimp"???? What the heck kinda of cross-allergen control polices are in place at that manufacturer? Bad enough that their product cannot reasonably be labelled as either gluten-free or vegetarian/vegan? This is a snack whose main ingredients are beans, rice, and salt. Ay-yi-freakin'-yi. That's some serious point dockage there. In case you can still ingest these, like I can, the flavor profile also kinda lacks. Silly as it sounds, these sticks might taste too much like black beans (over 60%, says the blurb on the back) and black beans, taste like, well, not much. That's why if we're making them up for some tacos or making a black bean soup, we're sure to add lots of stuff like cumin, which perhaps tricks us into thinking we like black beans more than we actually do. There's a little salt here, which is kinda boring tasting - really, a little cumin or paprika or slight chile powder dusting would have been better, in my opinion. Anyways, these Inner Beans make an okay dip stick - I dunked some of them into a little homemade guacamole I made and was reasonably happy with the results. Yet, after a few bites, the flavor just kinda goes back to the rice flour more than anything, and I can't shake that lingering essence off my molars. Meh. Sandy enjoys these kinda things more than I do, usually, and this time was not an exception. "I'd get these for a car trip or something for a light snack," she said. But I can tell she's not overly enamored, especially when she gave them a half-hearted three.That's more generous than I can go. As is appropriate for their buck-fifty price tag, I'm going 1.5. I love the Inner Peas (Snap Pea Crisp knockoffs). Saw these last week and was unenthused. Ooh, I do love a good shrubbery-esque veggie pun. They could do a season item: "Oh Come Lettuce Adore Him"
I love the blog - thanks and best wishes for the holidays! This is just a guess, but if these are made by the same manufacturer that makes the brand name ones (Calbee), they also make shrimp chips and a bunch of other snacks, which could explain the cross-contamination warning. I actually love these! The Inner Peas are good too, but I find this better. Love your blog - thank you and please keep up the excellent content! I love these! I'm not anywhere near a TJ's, so I am having a friend ship me three bags. SO good with salsa, guac, or just on their own. Yum-o! OMG these are awesome! I mean, on their own..meh. But when I toss in 1 Tbsp Anthony's Premium cheddar cheese powder (Amazon) and shake, I've got healthy Cheesy Poofs! Need to keep in fridge cuz no preservatives in the cheese.